Shockley argues that a rigid notion of black aesthetics commonly circulates that is little more than a caricature of the concept. 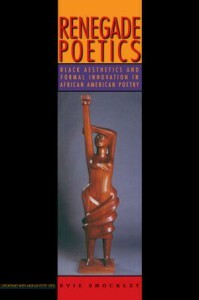 She sees the Black Aesthetic as influencing not only African American poets and their poetic production, but also, through its shaping of criteria and values, the reception of their work. Taking as its starting point the young BAM artists’ and activists’ insistence upon the interconnectedness of culture and politics, this study delineates how African American poets—in particular, Gwendolyn Brooks, Sonia Sanchez, Harryette Mullen, Anne Spencer, Ed Roberson, and Will Alexander—generate formally innovative responses to their various historical and cultural contexts. Out of her readings, Shockley eloquently builds a case for redefining black aesthetics descriptively, to account for nearly a century of efforts by African American poets and critics to name and tackle issues of racial identity and self-determination. In the process, she resituates innovative poetry that has been dismissed, marginalized, or misread because its experiments were not “recognizably black”—or, in relation to the avant-garde tradition, because they were.